It was one of the largest and most complex operations of its kind. Took a whole lot of time, but once it ended, the outcome is truly astonishing! 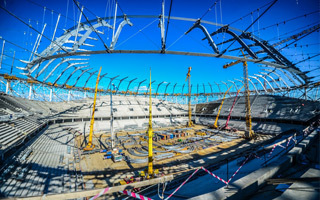 It lasted a long 1.5 month before the tensile cable structure of Volgograd Arena's roof got to its final position. This makes it one of the longest operation of this kind in world stadia. Having begun in late May, the operation has only just finished last week. We should note that this constitutes a significant delay, because the construction manager Sergey Kamin had previously suggested it would be done by April. Still here? Great, let's explore the project further! There's a lot to find, quite literally too. Including areas outside the seating bowl itself, the stadium roof will cover a stunning space of 77,000 m2. Vast majority will be covered by strong membrane and polycarbonate panels (inner edge of the roof), though as of now we don't know the exact sizes of each part. Tensile cable roofs have become quite common recently, this one isn't even Russia's first (that would be Krasnodar). However, the one in Volgograd is unlike any other before. The difference lies with 44 steel consoles, each shaped like the Cyrillic letter Г (g) and each 25 meters tall. Installing these cast elements made the big lift so complicated. First, the upper cable ring was lifted to the height of 27 meters. This is when all 44 consoles were installed onto it (from early June), while their lower ends resting near the ground. There the lower cables were attached to them, allowing the entire structure to later go up as one large system. This meant extremely precise surveillence of the process in order to carry it out without issues. Eventually, in early July, the entirety reached its final height, with upper ends of the consoles reaching 49.5 meters in height. Together they create an impression of a steel crown hovering above the field. It took half a year of preparations on site to get to this point, not even mentioning the length of manufacturing process outside Russia. It should be noted that all primary steel cables were manufactured in eastern Switzerland's Romanshorn, which meant the 12 kilometer-long and 650-ton load had to travel roughly 3,000 kilometers to Volgograd! It also required supervision from French engineers throughout the lifting operation. Now the 2,1000-ton structure awaits its final element: the cladding. This will also require quite a lot of skills, but Volgograd's most crucial phase has been finished successfully!